Far East Organization, Singapore’s largest private development company, has commissioned the Office for Metropolitan Architecture for OMA’s first architectural project in Singapore – a 36-storey residential high-rise. The Singapore tower is a design by OMA Partner Ole Scheeren. Unlike most architecture firms OMA are a collaborative office which works as a Partnership. 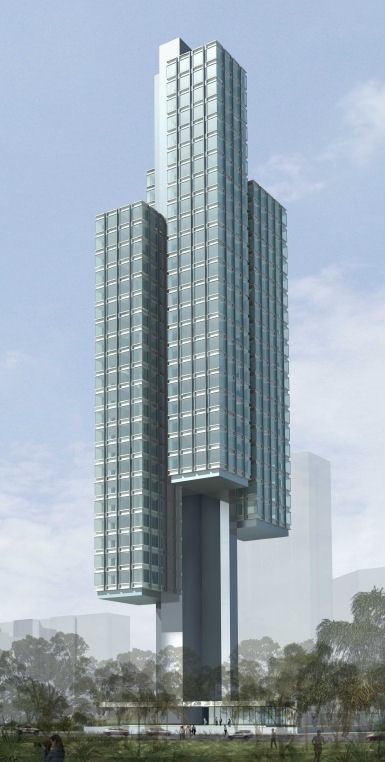 The 153 meter tall tower will be located at the intersection of Scotts Road and Cairnhill Road, in close proximity to Orchard Road, Singapore’s famous shopping and lifestyle street. With 20,000m² of built floor area, the building will provide 68 high-end apartment units with panoramic views.